Paul E. Rice, Jr. Earns Martindale Hubbell AV® Preeminent™ Rating. 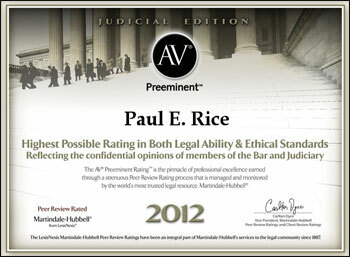 Rice & Rose Attorney Paul E. Rice, Jr, Esq., has earned the Martindale Hubbell AV® Preeminent™ rating. Ratings are important - to those who are rated and to those who use the ratings. The AV® Preeminent™ rating is the most powerful, relying on members of the Bar and the Judiciary to recommend and rate peers on both ethical standards and quality of legal work for over 130 years.